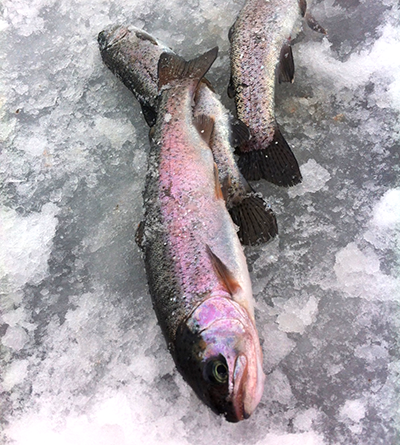 With new regulation changes in 2014 allowing designated trout lakes to be open during the winter months in Crow Wing County, trout fishing has now become a year-round activity in the Cuyuna County State Recreation Area. Learning the patterns of these “new” fish over the past 2 seasons has taught us one thing; trout are even more fun to catch through the ice than in open water! Trout will range in depths of 4’ (right next to shore) to 90’+ out over basin areas in the pits, but are generally high in the water column and can easily be caught using today’s electronics and typical panfish/perch tackle. Small spoons tipped with waxies or eurolarvae work best, while some target them using artificial minnows profiles such as jigging Rapalas, etc. Early morning hours are best but trout can be caught throughout the day making this a very family-friendly approach to a weekend of fishing.